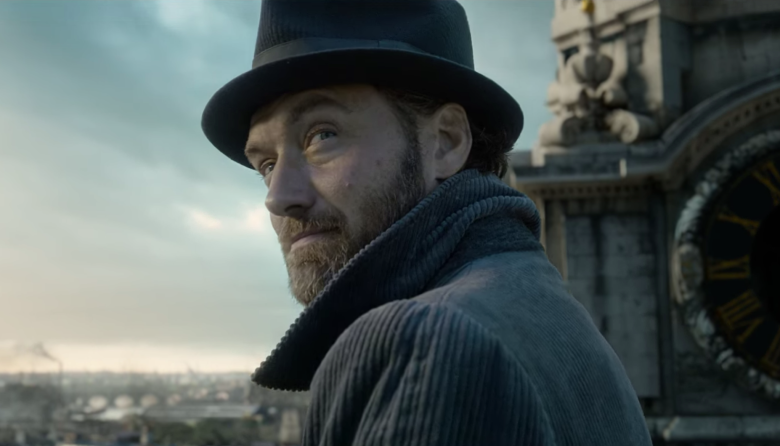 Evanna Lynch Talks Jude Law’s Dumbledore While Law and Co-Stars Head to China! Evanna Lynch attended the Animal Equality’s annual gala on Saturday and took some time out of her presenting duties to discuss the highly-anticipated film Fantastic Beasts: The Crimes of Grindelwald, set to release worldwide Nov. 16. Lynch has more insight into the characterization of wizarding greats such as Albus Dumbledore than most. A fan herself before being cast as Luna Lovegood in the Harry Potter films, she has clearly not lost her enthusiasm for J.K. Rowling’s magical series. And having had access to Rowling’s onset input into the depiction of the characters and interaction with Michael Gambon, who portrayed Dumbledore from Harry Potter and the Prisoner of Azkaban on, Lynch is uniquely qualified to render an opinion on the man now portraying him. Given the opportunity, she did just that! This is exciting confirmation for long-time fans keenly aware of Dumbledore’s deep, layered backstory and complex, multifaceted persona. On the one hand, Dumbledore is open and accessible, especially with Harry. On the other hand, he’s somehow equally elusive and mysterious. 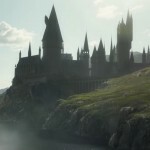 He is an enigma fans have been anxiously waiting to learn more about, and Rowling has finally opened Pandora’s box! 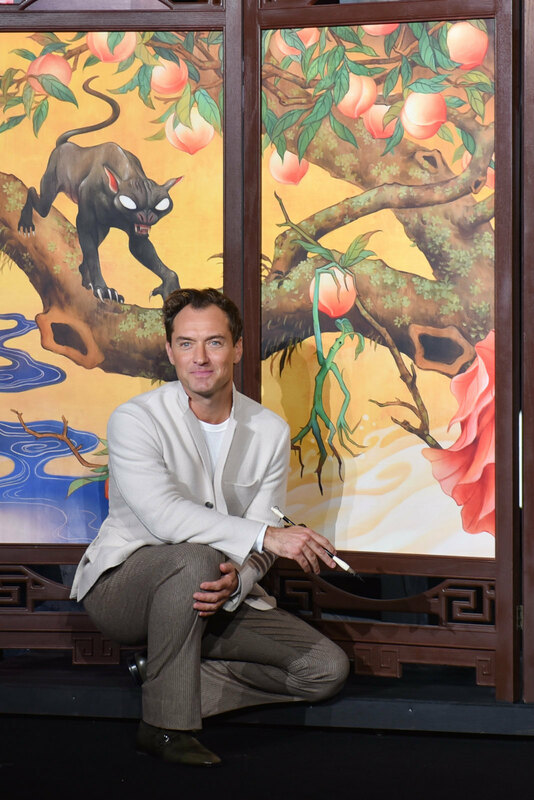 Meanwhile, the man bearing young Dumbledore’s mantle, Jude Law himself, is in China alongside co-stars Eddie Redmayne (Newt Scamander), Katherine Waterston (Tina Goldstein) and Ezra Miller (Credence Barebone) for a global press tour promoting the film. 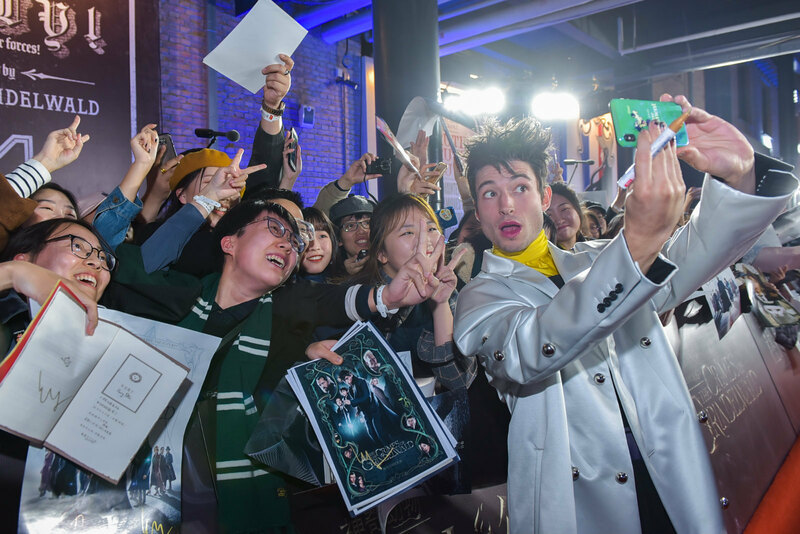 The four actors were greeted by a throng of ecstatic Chinese fans and posed before gorgeous new posters depicting stylized renderings of fantastic beasts. Note the inclusion of the niffler and babies, bowtruckle, kelpie and the madagot! 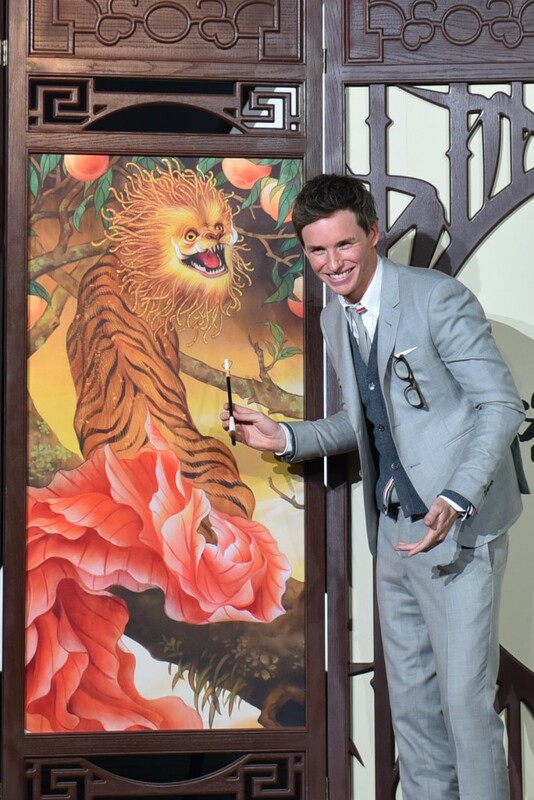 The Chinese site covering the tour said that the beasts were painted in a “peach tree with abundant fruits, which means ‘the gods and beasts get by on the screen of six blessings.’ ” The translation to English is a little choppy, but the general idea is clear. The designer meant to show the relationship between the beasts and the supernatural powers depicted in mythology–the connection between the two defies explanation, leaving one to accept the existence of the magical. The quote also references “six blessings.” As there are six beasts shown, there must be an intentional link there as well. Either six beasts are shown to symbolically represent “six blessings” in traditional mythology which hold deep meaning in the Asian culture, or the beasts are, more literally, an actual “blessing” to those who are worthy of engaging with them and gaining their trust. 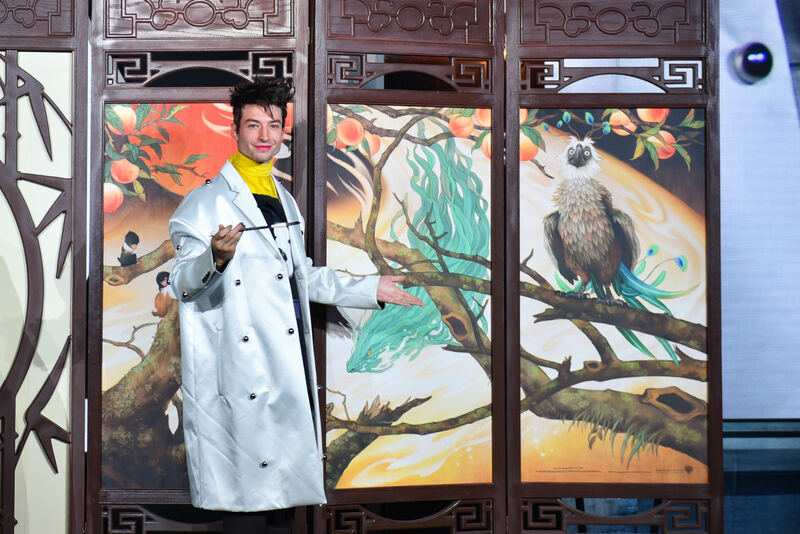 Are there any Potter fans with specific knowledge of Chinese mythology who can weigh in and enlighten us? Check out the full poster, shared by Reddit, below, and tell us what you think of it! 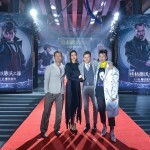 Also, visit LinkedDB to see more pictures of the cast on their press tour here.